PayPal is a popular online payment system that lets you send and receive money online—and now in some physical stores—with the added benefit of buyer and seller protection for most transactions. Payments aren’t limited to a standard browser transaction; the company has a free mobile app that lets you send and receive money securely. To use the PayPal mobile app, you’ll need to first login to your PayPal account through a browser and create a PIN for your iPad or iPhone. This eight-character PIN adds an extra step of verification for your safety; PayPal will call or text your phone and ask for your PIN before a mobile transaction can be completed. If you’re new to PayPal, you must link your bank account, credit card, or debit card to your PayPal account. PayPal will securely store and encrypt your information on the company’s servers, so buyers will never have to share their financial information with retailers or resellers. PayPal’s home screen shows four tabs: Account, Send, Request, and Local. 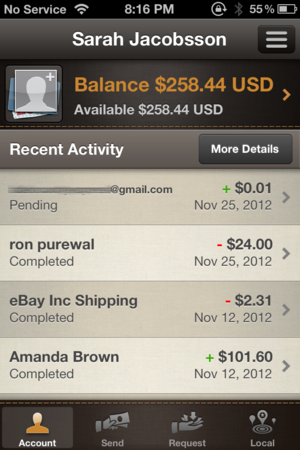 The account tab is for monitoring your PayPal account; here you can see your balance, including all recent transactions. Click on each transaction to see the details, like when the transaction took place, the status of the transaction (whether it’s pending or completed), and the dollar amount of the transaction. You can also see the unique transaction ID from this screen. The send and request tabs let you, well, send and request money. To send money, just tap the send tab and type in the email address or mobile number of the person you want to send money to. You can then enter in the amount of money, add an optional message, and choose whether you’re sending to friends and family or for a good or service. PayPal doesn’t charge a transaction fee to send or receive money from friends and family, but those transactions won’t be protected under PayPal’s Purchase Protection policies. To request money, tap the request tab and enter in the email address or mobile number of the person you’re requesting money from, the amount of money you’re requesting, and an optional message. 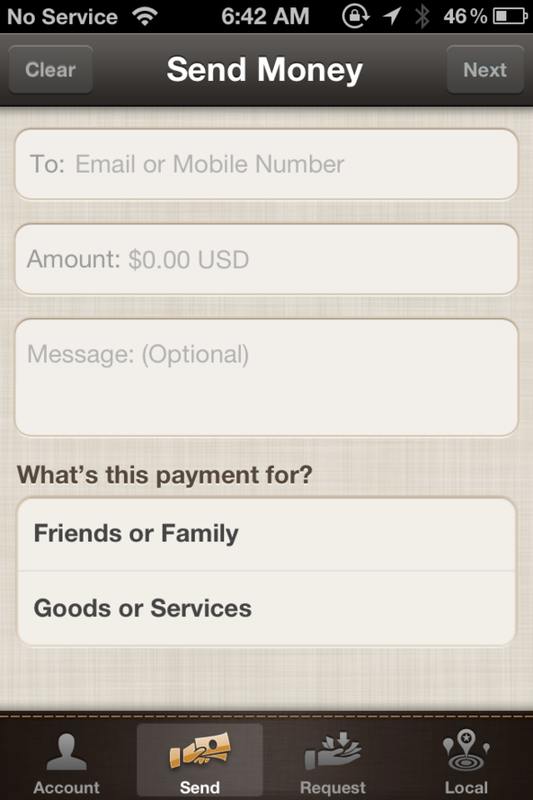 Before you send or request money, you’ll be prompted to confirm the transaction by pop-up notification. The local tab uses your location to determine if there are any nearby businesses that accept PayPal. This feature is pretty helpful if you’d rather use PayPal to checkout when you’re out shopping. Once you find a location that accepts PayPal, you can pay by “checking in” to the location. Just slide the map pin down to notify the business that you’re ready to pay. You can then send money from your PayPal account to theirs. 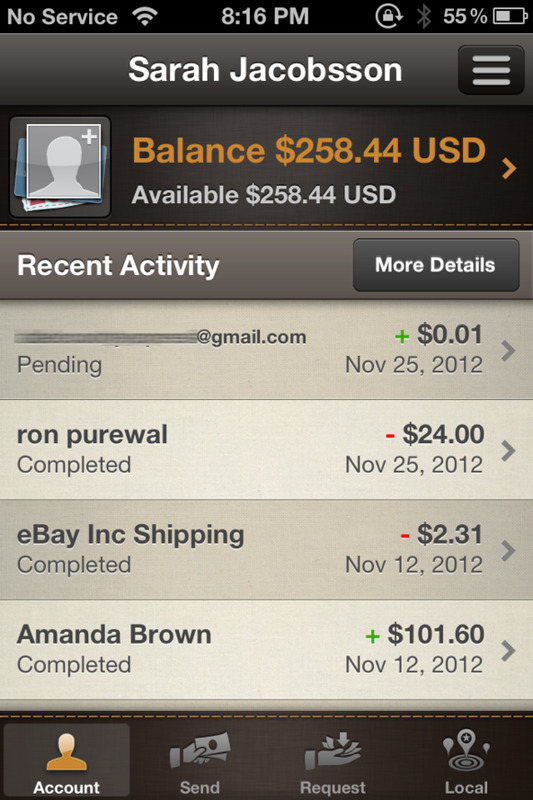 PayPal’s mobile app is useful, without being overwhelmingly full-fledged. You can send or receive money and check your account status, but you can’t perform more complicated tasks, such as transferring money from your PayPal account to your bank account. The local tab is helpful, since it allows you to locate people and businesses who are willing, to take PayPal as a form of payment.